For PCI(e) passthrough a CPU with VT-d/AMD-d CPU flag is needed. Which virtualization solution fits your needs? Many enterprises move to open source solutions for their virtualized infrastructure to guarantee full access to all functionalities, further reduce costs, and deliver high security and reliability. By migrating from VMware, Microsoft or Citrix to Proxmox VE, you gain the ability to manage physical, virtual, and cross-platform, adapt cloud computing to your business needs through greater choice, and achieve greater value for less cost. Subscriptions are licensed per physical server and CPU socket. In a Proxmox VE Cluster you need to have the same subscription level for all your servers. Subscription period is one year from purchase date. 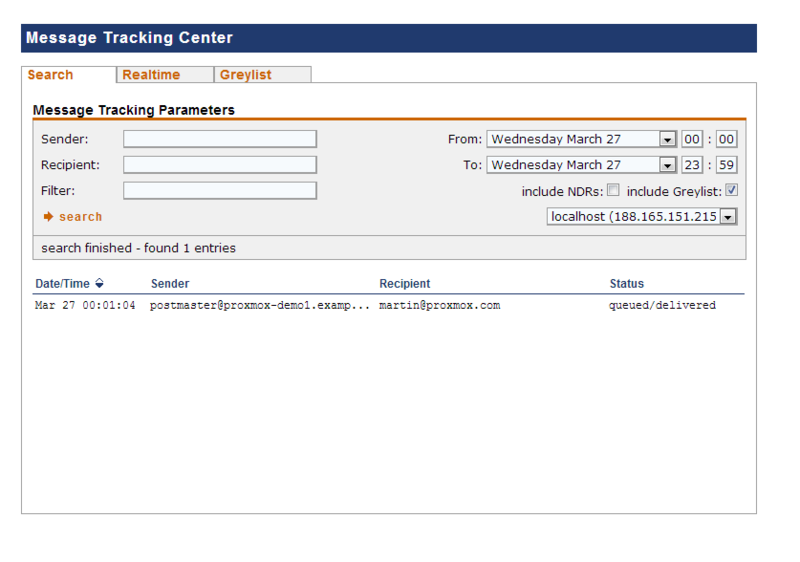 Technical support is done via the web/email-based Proxmox Customer Portal (in English or German). Community support is done via the public support forum. Proxmox is a Debian-based platformProxmox VE is based on Debian GNU/Linux and uses a customized Linux Kernel. The Proxmox VE source code is free, released under the GNU Affero General Public License, v3 (GNU AGPL, v3). This means that you are free to use the software, inspect the source code at any time or contribute to the project yourself. Using open source software guarantees you full access to all functionalities at any time as well as a high level of reliability and security. We encourage everybody to contribute to the Proxmox VE project while Proxmox, the company behind it, ensure that the product meets consistent and professional quality criteria. Create and manage Qemu/KVM Virtual Machines with Proxmox VE. The full virtualization solution Kernel-based virtual machine (KVM) is the leading Linux virtualization technique. KVM is a kernel module merged into the mainline Linux kernel and runs with near native performance on all x86 hardware with support for virtualization – either Intel VT-x or AMD-V.
You can use KVM to run both Windows and Linux in virtual machines (VMs) where each VM has private virtualized hardware: a network card, disk, graphics adapter, etc. To run multiple applications in VMs on single server hardware platforms enables you to save cost and build the agile and flexible virtualization environment that meet your business demands. Proxmox VE includes KVM virtualization support since the beginning of our journey back in 2008 (since 0.9beta2). Create and manage lightweight containers with LXC. Containers are a lightweight alternative to full machine virtualization offering lower overhead. LXC is an operating-system-level virtualization environment for running multiple isolated Linux systems on a single Linux control host. LXC works as userspace interface for the Linux kernel containment features. Linux users can easily create and manage system or application containers with a powerful API and simple tools. With the integrated feature for live/online migration you can move a running virtual machine in Proxmox VE from one cluster node to another without any downtime or noticeable effect from the end user side. Administrators can initiate this process either scripted or with the GUI making it a relatively simple process. It allows you to easily take a virtual machine offline for maintenance or upgrade reasons. While many people start with a single node, Proxmox VE can scale out to a large set of clustered nodes. The cluster stack is fully integrated and ships with the default installation. The integrated web-based management interface gives you a clean overview of all your KVM guests and Linux containers and even of your whole cluster. You can easily manage your VMs and containers, storage or cluster from the GUI. There is no need to install a separate, complex, and pricy management server. 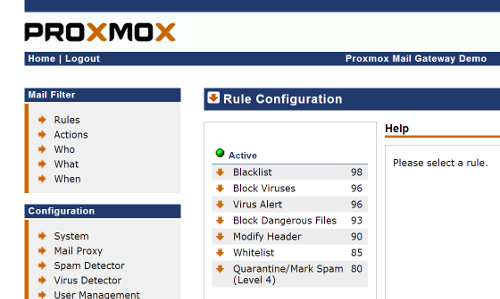 Proxmox VE uses the unique Proxmox Cluster file system (pmxcfs), a database-driven file system for storing configuration files. This enables you to store the configuration of thousands of virtual machines. By using corosync, these files are replicated in real time on all cluster nodes. The file system stores all data inside a persistent database on disk, nonetheless, a copy of the data resides in RAM which provides a maximum storage size is 30MB - more than enough for thousands of VMs. Proxmox VE is the only virtualization platform using this unique cluster file system. For advanced users who are used to the comfort of the Unix shell or Windows Powershell, Proxmox VE provides a command line interface to manage all the components of your virtual environment. This command line interface has intelligent tab completion and full documentation in the form of UNIX man pages. Proxmox VE uses a RESTful API. We choose JSON as primary data format, and the whole API is formally defined using JSON Schema. This enables fast and easy integration for third party management tools like custom hosting environments. You can define granular access for all objects (like VM´s, storages, nodes, etc.) by using the role based user- and permission management. This allows you to define privileges and helps you to control access to objects. This concept is also known as access control lists: Each permission specifies a subject (a user or group) and a role (set of privileges) on a specific path. Proxmox VE supports multiple authentication sources like Microsoft Active Directory, LDAP, Linux PAM standard authentication or the built-in Proxmox VE authentication server. Backups are a basic requirement for any sensible IT deployment. Proxmox VE provides a fully integrated solution, using the capabilities of each storage and each guest system type. Proxmox VE backups are always full backups - containing the VM/CT configuration and all data. Backups can be easily started via the GUI or via the vzdump backup tool (via command line). The integrated backup tool (vzdump) creates consistent snapshots of running containers and KVM guests. It basically creates an archive of the VM or CT data and also includes the VM/CT configuration files. Backup jobs can be scheduled so that they are executed automatically on specific days and times, for selectable nodes and guest systems. KVM live backup works for all storage types including VM images on NFS, iSCSI LUN, Ceph RBD or Sheepdog. The Proxmox VE backup format is optimized for storing VM backups fast and effectively (sparse files, out of order data, minimized I/O). 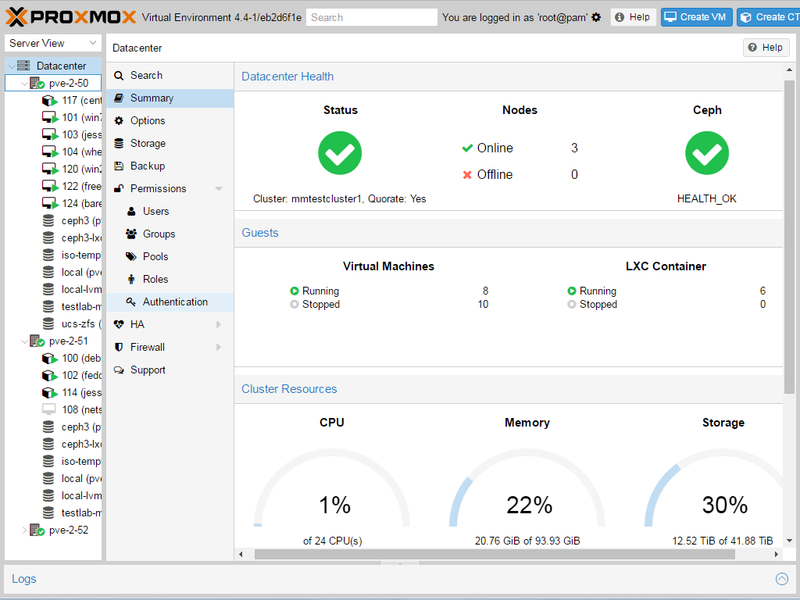 A multi-node Proxmox VE HA Cluster enables the definition of highly available virtual servers. The Proxmox VE HA Cluster is based on proven Linux HA technologies, providing stable and reliable HA service. During deployment, the resource manager called Proxmox VE HA Manager monitors all virtual machines and containers on the whole cluster and automatically gets into action if one of them fails. The Proxmox VE HA Manager requires zero configuration, it works out of the box. Additionally, watchdog-based fencing simplifies deployments dramatically. For easy handling the whole Proxmox VE HA Cluster settings can be configured via the integrated web-based GUI. The integrated Proxmox VE HA Simulator enables you to learn all HA functionality and test your setup prior to going into production. Proxmox VE uses a bridged networking model. Each host can have up to 4094 bridges. Bridges are like physical network switches implemented in software on the Proxmox VE host. All VMs can share one bridge as if virtual network cables from each guest were all plugged into the same switch. For connecting VMs to the outside world, bridges are attached to physical network cards assigned a TCP/IP configuration. For further flexibility, VLANs (IEEE 802.1q) and network bonding/aggregation are possible. In this way it is possible to build complex, flexible virtual networks for the Proxmox VE hosts, leveraging the full power of the Linux network stack. The Proxmox VE storage model is very flexible. Virtual machine images can either be stored on one or several local storages or on shared storage like NFS and on SAN. There are no limits, you may configure as many storage definitions as you like. You can use all storage technologies available for Debian Linux. The benefit of storing VMs on shared storage is the ability to live-migrate running machines without any downtime. Note: This list is not complete and work in progress. Facts could change from release to release. It provides a very rough overview about some differences and major features. 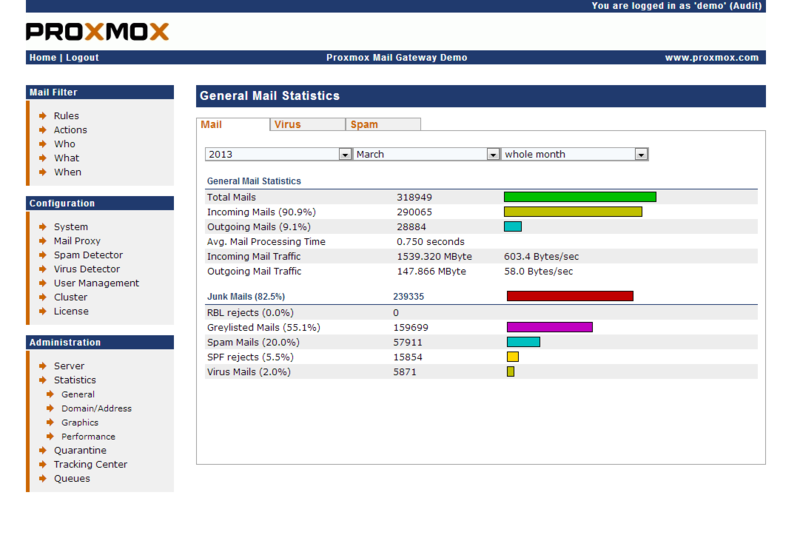 With this dual-engine support, Proxmox Mail Gateway combines signature-less high-performance and cloud-based immediate scanning capabilities from Commtouch with traditional, signature-based scanning from ClamAV. As a third scanner option, you can additionally license Avira SAV for full protection.